TOP 12 Jersey Shore Destinations as we cruise down South on the Garden State Parkway! Grab a bucket and shovel, a blanket and a picnic lunch, and head south on the Garden State Parkway for a fun-filled family outing to one of New Jersey’s beautiful beaches. Don’t forget the suntan lotion, visor, bathing suit and umbrella, as well as extra clothes because you can spend the whole day, a few days, a week or the entire summer. Featured here are the Garden State Parkway Exits and associated beaches as you travel South, as well as nearby attractions and upcoming events. You never have to leave the state. Grab a bucket and shovel, a blanket and a picnic lunch, and head south on the Garden State Parkway for a fun-filled family outing to one of New Jersey’s beautiful beaches. Don’t forget the suntan lotion, visor, bathing suit and umbrella, as well as extra clothes because you can spend the whole day, a few days, a week or the entire summer. Featured here are the Garden State Parkway Exits and associated beaches as you travel South, as well as nearby attractions and upcoming events. You never have to leave the state. There’s so much happening here in NJ! 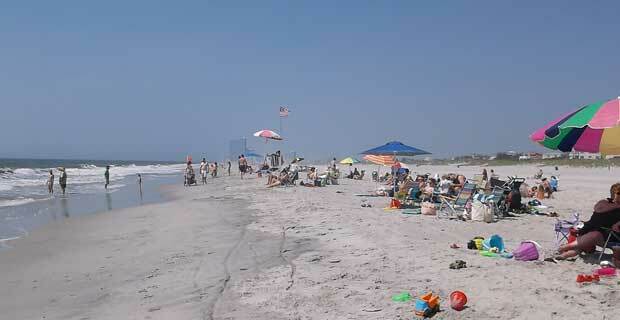 A 7-mile stretch of sandy beaches bordering both the bay and the ocean. Enjoy swimming, sunning and surf fishing. Nearby activities: Gateway National Park, including Fort Hancock and Fort Hancock Museum; Twin Lights; Maritime Museum; hiking; biking; birding. Nearby Attraction: Keansburg Amusement Park and Runaway Rapids Water Park. Campfire on the Beach: August 28, 7:30-9PM. Enjoy the beach, new boardwalk and Seven Presidents Oceanfront Park, a 33-acre county park with facilities for swimming, boating and picnicking. Nearby attraction: Pier Village with shops and restaurants. Family friendly with kids’ parks, Victorian Style houses, concert music series, and other entertainment. Surrounded by nearby beaches including Asbury Park, Avon By The Sea, and Ocean Grove. Walk along the revitalized Boardwalk of Asbury Park and you’ll find unique shops, eclectic restaurants and other entertainment. Experience Ocean Grove shops, arts and crafts shows, and the giant flea market at the Great Auditorium. Concert Series: Monday, Friday & Saturday, 7:00-9:30pm Fifth Avenue Gazebo on the Ocean Avenue. 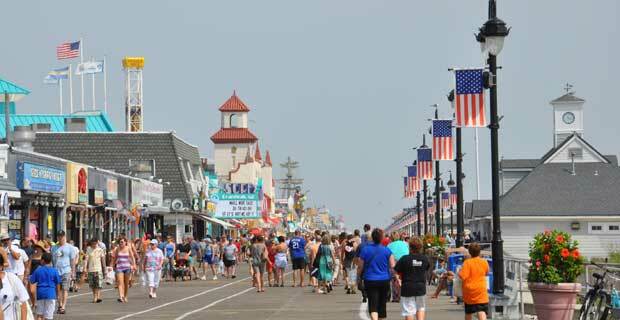 All the beach fun plus a mile long boardwalk. Walk along the famous boardwalk with dozens of rides alongside games of chance, some of the most competitive miniature golf and Jenkinson’s Aquarium. There are Kiddie Beach Shows and concerts held throughout the summer. Popular departure spot for fishing excursions. Antique lovers, there’s a large antique center nearby! Elks Beach in Manasquan is the only beach dedicated to the handicapped in the Jersey Shore area, providing handicapped parking and a wooden boardwalk to a platform on the beach. In addition, there are several large handicapped chairs available for the use. A barrier island only accessible by a causeway over the Manahawkin Bridge, the beach is quiet and family oriented. After the beach, visit the amusement park, go mini-golfing, or see a family friendly show at the Surflight Theater. Nearby Attraction: Tuckerton Seaport and Batsto Village. Relax on pristine white sandy beaches or get active and try your hand at sport fishing and windsurfing. Kids love Shark Park Playground. Other sites include the Marine Mammal Stranding Center, Brigantine Lighthouse and Brigantine Beach Historical Museum. Across the bridge is the world famous Atlantic City Boardwalk. Take a walking tour (approx. 2 miles and 90 min.) of the first boardwalk in the U.S. Then soak up the sun and jump the waves at the beach. Lots of outlet shopping here. Located at the tip of Cape May County, Ocean City is family-friendly beach town, complete with Gillian’s Wonderland Pier Amusement Park, an arcade, boardwalk, and mini-golf. For the music lover - Ocean City Pops Orchestra concerts. Flanked by the Atlantic Ocean on the East and the Inter-coastal Waterway on the west, Stone Harbor is known as Seven Mile Island and has endless beautiful, family beaches. Non-beach activity: Wetlands Institute, a nature center, featuring exhibits on marine live; dune walks and kayaking. Voted one of the top New Jersey beaches, Wildwood has it all – powder white beaches, an abundance of sport opportunities, amusement parks, water parks and more. Best of all – no badge fee! Other activities include historical tours, zoo, dolphin tours, horticultural gardens and more. Fireworks on the Beach: every Friday 10pm. Concerts: Saturday 8pm. Located at the southern tip of Cape May Peninsula where the Delaware Bay meets the Atlantic Ocean, Cape May is a perfect destination for both couples and families. There are beautiful powdery beaches, plus its biggest attractions, the Cape May County Park and Zoo, Nature Center of Cape May, and Naval Air Station Wildwood Aviation Museum at Cape May Airport. Important: Beach Badges and Daily Fees apply and differ for all beaches. For most, kids under 12 are Free.